My last two posts talked about how I used a Raspberry Pi to act as a low-power home server that now mainly serves two functions: as a NAS box and as a Torrentbox. 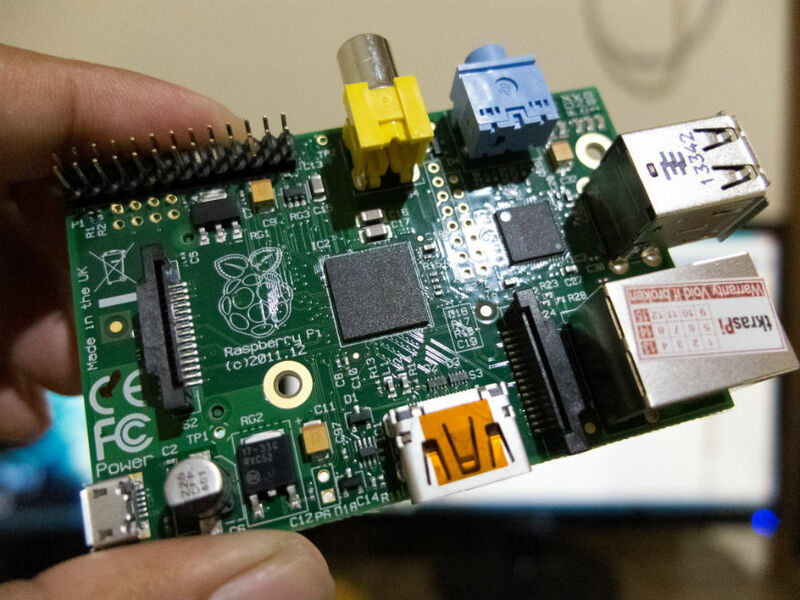 Now, there are a multitude of other things that we can do with the Raspberry Pi, and a lot of them are controllable using a web-based interface. This gives us ease of control using a lot of devices, but still limits us to the confines of our local network. This post will attempt to address that. I don’t have a static IP assigned to my home internet connection. This means that each time something forces my modem to disconnect and then reconnect, I will have a different public IP address. Not good if I want to set up remote access for, let’s say, my Deluge web interface, because I’d have to first figure out what my public IP address changes to, which means I’d have to go home and… well, you get the idea. Hence, Dynamic DNS, or DDNS. The first thing I need to do to make this work is to enable port forwarding. If you don’t know what it is, a simple Google search will get you all the info you need. For the sake of example, I’ll be forwarding port 22 to my Raspberry Pi’s port 22 so that I can access its ssh from outside my network. Next, I need to set up the Dynamic DNS service. What it does is basically enable me to route all requests to a particular URL so that it reaches the IP address of my choice. There are two ways to go about doing this. A popular free Dynamic DNS service, DynDNS, apparently has stopped its free service. One of the free alternatives that many people start to use is NoIP. After signing up for free, I get to choose my subdomain. Why a subdomain? Because it’s free. After I have my subdomain setup, I can go ahead and download the DUC Client for Linux. 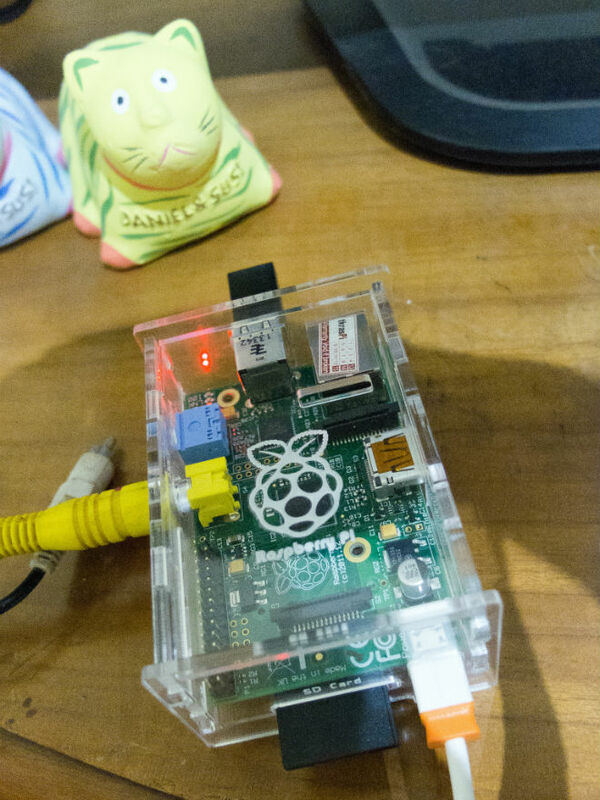 There are plenty of instructions on the internet on how to set this up on a Raspbian Wheezy. After I got it up and running on boot on my Pi, I can sit back, relax, and have my Pi update its public IP address to the NoIP service. I can then access my Pi’s secure shell from anywhere by instructing PuTTY to connect to [mysubdomain]. [my-no-ip-domain] at port 22. There’s a catch, though. I’d have to reactivate the free subdomain every 30 days. Well, they gotta do something to get me to buy their paid services, right? But wait… there’s another way. One of the perks of having my own domain and hosting at IdWebHost is that I can have as many subdomains as I’d like, and it’s dirt cheap. Check their pricing tables for more info, and I also have to say kudos to their customer support team that runs 24/7. Before I do anything else, I setup a subdomain and confirm that it is indeed accessible. I also check my A records using the Zone DNS Editor. This could be different for each hosting company, so I won’t go into its details here; it’s best to ask their customer support directly. The Dynamic DNS service of my choice is CloudFlare. I’ve heard a lot about them, and most are positive reviews. Most important, though, is that they offer a free service package. I then enter add my domain and let CloudFlare scan my DNS records. After the usual sign-up – confirm email – activate 2-factor authentication routine, I proceeded with setting up my domain. I let CloudFlare scan my DNS records, and make sure that the new subdomain I added earlier is detected. If not, I just manually add a new A record, copying settings from my domain’s A record. Next, I go and read an article about how to set up a custom script both on my hosted web and on my Pi to automatically check for public IP changes every 5 minutes. Just for fun, I changed the PHP script a bit so that it sends me an email every time it detects that my public IP address has changed. Finally, I have to actually make the internet use CloudFlare’s DNS to make this all work. So I go to my IdWebHost management page, and set my nameservers to point to CloudFlare’s nameservers instead of IdWebHost’s. People usually say that DNS update propagation is slow as a slug and it takes up to 24 hours at a time to make the updates propagate. Not the case with CloudFlare. I just need to issue a “ipconfig /flushdns” on my Windows command prompt a few times to force an update. A word of caution for this setup: because of the way some web hosting companies setup their CPanel sites as [domain]:[port], in other words it doesn’t use a subdomain for CPanel, you may need to tinker a little bit with your DNS settings so that CPanel doesn’t run through CloudFlare’s CDN. I chose to completely bypass CloudFlare’s CDN, except for this blog, because really the only thing I’m using from them is the Dynamic DNS service. Your mileage will vary. Now, I have access to my home network that I can configure simply by configuring port forwarding on my router, and I don’t have to worry about my public IP address changing after a blackout (which unfortunately is a common thing on this side of the world). As a matter of fact, my house just experienced a blackout today at about 9 a.m., at which time everybody was out working. At about 3.15 p.m., I was able to access my torrentbox from my cellphone. A query on my Pi’s uptime showed 12 minutes, which means that within 12 minutes of my Pi starting up, my new public IP was successfully propagated. Awesome! I like the idea of thin client access, which minimizes resource usage on the Pi itself. That’s why I chose Deluge. I did try using Transmission, and the fact that I need to run the Transmission desktop client on X so that I can access its web UI appalled me. So there you go, Deluge FTW! I log in as mysambauser to do everything, so that the thin client will run as mysambauser. Why? Because I think running it as a user who already has access to the USB HDD mounts makes a lot more sense than adding pi to the sambausers user group. If I wanted to be more careful, I’d create an entirely new user, let’s say deluge-user, put it in the sambausers group, and work from there. But I’m too lazy for that. Ha! 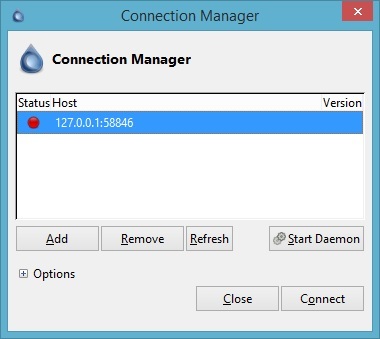 I then have to restart Deluge client to load the classic interface, and be presented with the connection manager. Next, I enter mysambauser’s credentials (leaving the port alone for now), and click connect. Alright, so now I can control my Pi’s torrents from the comfort of my PC without having to keep my PC on to do the actual download. Cool bananas! Next, I browse from my PC to [Pi’s-IP-address-here]:[deluge-web’s-port]. I log in using the default password “deluge” and chose to change it immediately. Done. I’d want my downloads to go to my external hard drive, lest my SD card become crowded and eventually run out of space. I do this by going to Preferences, Downloads, and set up my directories there. This is the reason why I use the mysambauser user instead of the default pi user, because pi doesn’t have access to my external hard drive. I create four directories under /media/USBHDD1/Torrents: Backup, Completed, Incomplete, and Watch. 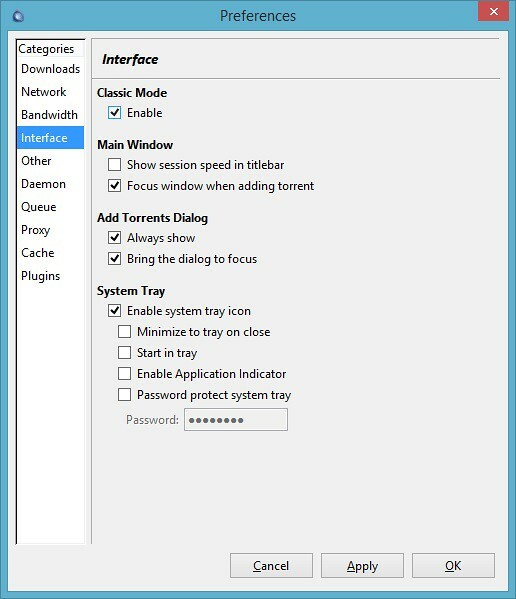 Next, I add a samba share location to the Torrents directory. This way I can just drop torrents into the Watch folder or copy completed torrents from my Completed folder. Easy. To test, simply copy a torrent file into the Watch directory. It’ll immediately disappear and be whisked to the Backup directory, and if you’re watching your desktop client or web UI, the torrents will show up and immediately start downloading. Delightful! After rebooting, if you can’t find the web UI, there’s something wrong either with the permissions, the hard drive mounting, or the init script itself. I won’t get into it as I experienced no problems at this point. So, there you have it, I now have a Pi box capable of leeching (and seeding torrents) automatically just by dropping a torrent file into the Watch folder, and can be controlled either with a desktop client or web UI. As before, any comments or suggestions are welcome. Cheers! I finally bought myself a Raspberry Pi Rev B from Element 14. 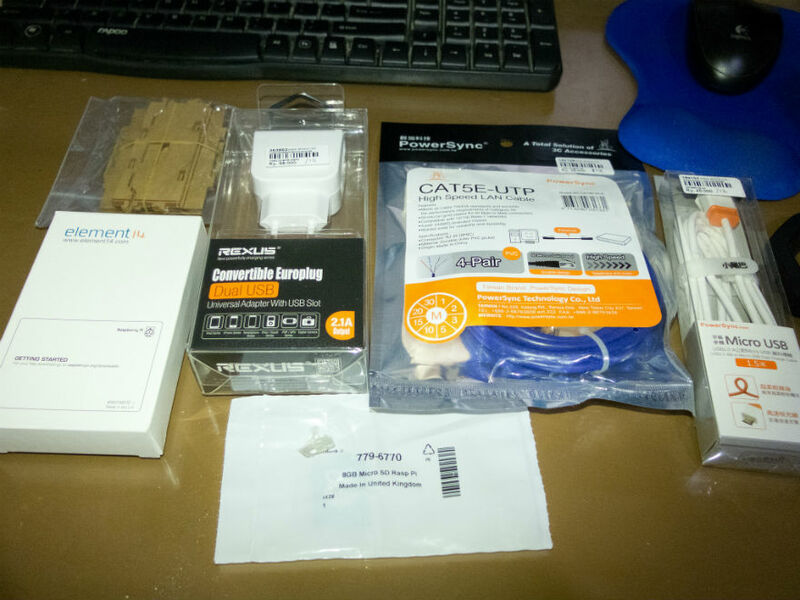 I got it from an importer in Bandung, and I decided I’d go for a little shopping myself to the computer store to get me the tidbits. So here’s my kit. The Pi, made in the U.K. 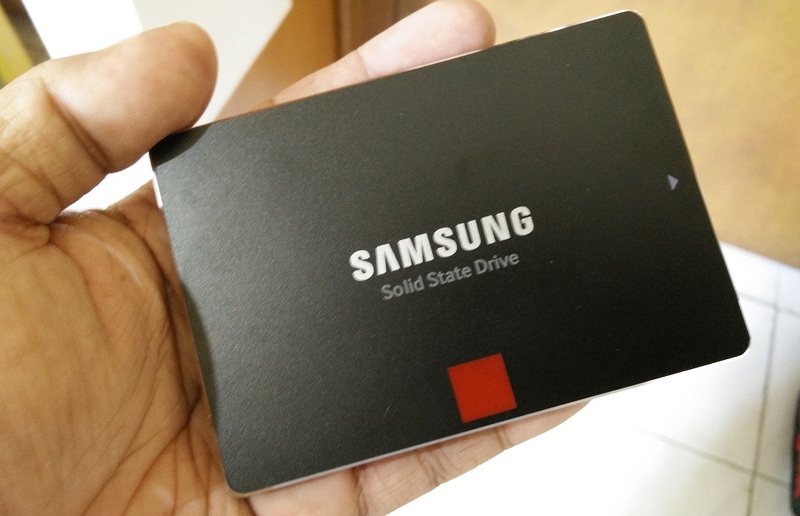 The plan is to get it to work with my existing Western Digital MyBook 2TB external hard drive. I found so many tutorials on the interwebs about how to do this, but I guess I’ll just share my experience. The hardware assembly is pretty straightforward. 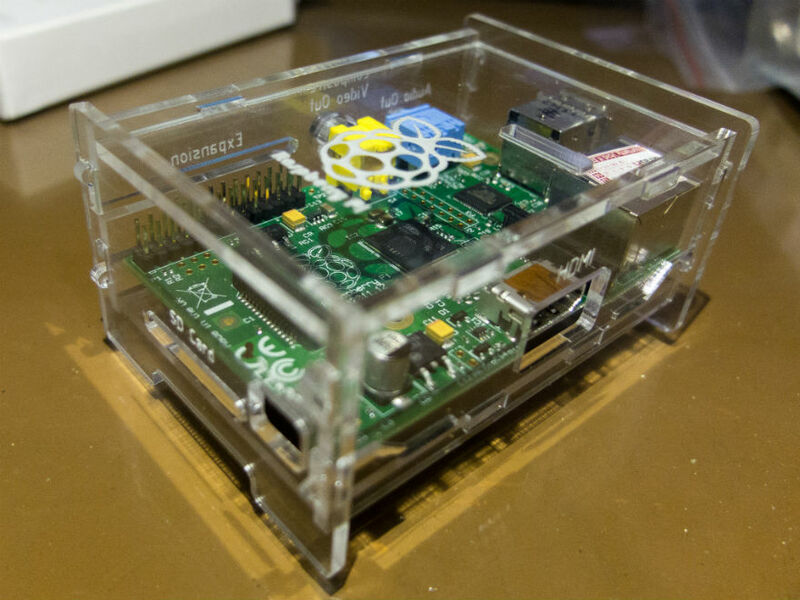 The acrylic case snaps together without any problems, and voilà, my Pi’s got a casing. Next, I need to flash the SD card. It’s already got NOOBS on it, but I won’t be using it because I want to use the latest Raspbian Wheezy. I downloaded it from the Raspberry Pi website and flashed my SD card using Win32 Disk Imager. No problems here. OK, so here’s the first problem. I have two 22″ monitors connected to my PC, and nothing else. So I had to hijack the TV in the living room to do the first boot. Luckily I have a wireless mouse/keyboard combo handy, so less cables and it plugs into just one USB port on the Pi. 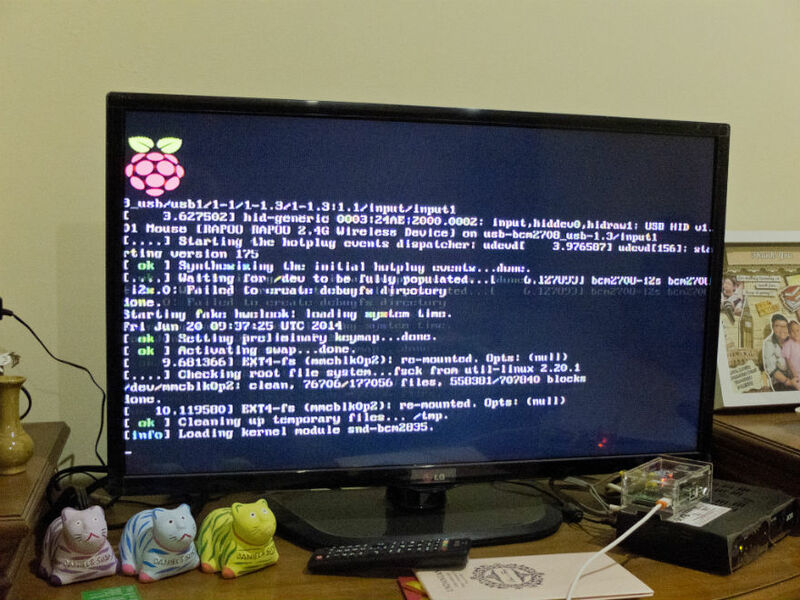 My Raspberry Pi Rev B, with 8GB SD Card, connected via RCA to my TV, controlled using a wireless keyboard. Yes, that’s a clay cat. I had to do this to install the Pi and enable SSH. Yes, I have three clay cats. Meow. Enable SSH. To do this go to Advanced, SSH, then Enable SSH. Take note of the hardware address shown, because it’ll come in handy later on when I reserve an IP address for the Pi. The Pi is now capable of running headless, so I shut it down. Then I moved it to a better position, and connected it via UTP to my router. I also plugged in my external hard drive. I’ll be continuing on the setup remotely from the comfort of my PC. Before powering it up again, I decided to go ahead and reserve an IP address for the Pi, using the web-based router management UI. I won’t go into this because every router is different, but the point is to “map” the MAC address of the Pi’s network interface card to an IP address typically assigned by the router’s DHCP server. Alright, now power up! The first thing I did after getting the Pi accessible by SSH (I use PuTTY for this) is to do a complete system update. The upgrade process required that I download 460MB worth of debian packages. After the update completed, I decided to create a backup of the image, using Win32 DiskImager that I also use to write the system image on the SD card. This way, when I want to do a fresh install, I have the Pi updated to a more recent version and ready to run headless. After saving the updated image, I decided to run raspi-config again to change my hostname. This is probably a good idea because if I buy another Raspberry Pi and run it using the image I just created, the two of them won’t have the same hostname. I deleted the one and only partition existing on the hard drive, and created a new primary partition that spans the entire disk. This is probably the scenario if you’re using a new hard drive. If you are going this route, just make sure you don’t have any data worth keeping on the disk. You have been warned. I then check that the partition is indeed available. Alright, now that I have the disk recognized as /dev/sda1, I need to make the filesystem. It takes a while to make the filesystem, so grabbing a cup of joe at this point might be a good idea. I decided to just add an entry into fstab and reboot the Pi so that I know for sure it works. Next, I reboot the machine. After logging in, I tried running df to see if the hard drive is properly mounted. Now that I’m sure I have the drive mounted properly on boot, it’s time to install samba. I found some instructions for how to do it, but it uses NTFS-formatted hard drives and is different than my setup. The samba part is, however, pretty much the same. Next, it’s always a good idea to store a backup of any config file before editing it. I repeated the private folder for every user I plan to have in the network to provide them with personal space. This would probably not be necessary if I had a huge SD card because I could just activate their home folders with read-and-write access. Unfortunately, that is not the case. Now, I need to change ownership of the mount point, set its permissions, and create the correct directory structure inside it to match the samba configuration file. I won’t go into the details of creating the directories, but I will point out that this will need to be done as the mysambauser user. All done! Now I can log out as mysambauser (and return to pi user) and start the samba service. Now I can browse to \\HOSTNAME from any Windows machine and map a network drive to the shares I just set up. NOTE: If you use a firewall of some sort, please make sure your firewall allows access to ports 137, 138, 139, and 445 using TCP, and also port 137 using UDP. These ports are in use either by Samba itself or Windows hostname resolution (NetBIOS). This article actually documents the second build. That’s why you may have noticed that the SD card in use is 16GB instead of 8GB. Also, I chose to use a wired connection to my router, I’m saving the Ralink for a second unit later on. The figures are approximations only and should be taken with a grain of salt. I am by no means an experienced tester, and these are just some real-world results that I’ve got from my week-long use of the Pi unit. Further testing should include simultaneous read/write operations serving anywhere from 2-10 clients concurrently, but I’ll leave that to Anand or Linus or whoever else wants to do the testing. Any comments or suggestions are welcome. Until next time. Cheers! Fire up your virtual machine and login. Run sudo apt-get install phpmyadmin to install the package. Direct your browser to localhost:8080/phpmyadmin. You should see the phpMyAdmin login page there. Try to login using the root account and the password you designated to it when you installed Ubuntu LAMP server. If you did not set a root password for MySQL, run cd /etc/phpmyadmin to switch to the phpMyAdmin installation directory and then run sudo pico config.inc.php to edit the configuration file. Press Ctrl-W and type in allownopassword to find the keyword, and then uncomment the line. Press Ctrl-X and then Y to save the file. You should now be able to log in as root without using a password. That’s it, we should now be able to use phpMyAdmin. Now, we’re going to install NetBeans PHP as our IDE of choice. You’re free to install any other IDE to your liking, but I’m only going to explain how to use NetBeans PHP. Go to the shared folder you have set up previously (see Part 1), create a new folder for your new project, and create a new index.php file there. Just fill it up with some HTML or some code. Download the Java SE Development Kit if you haven’t already done so. This is a prerequisite to install the NetBeans IDE. Install it. Download the installation file from the NetBeans website. Install it. Open NetBeans, then go to File –> New Project. Select PHP Application with Existing Sources. Click Next. Set the Sources Folder to the folder you created in step 1. Select your preferred PHP version, then click Next. Set the Run As option to Local Web Site, and click Finish. Make sure to edit your site URL to add your forwarded port number (set to 8080 in Part 1). We are now ready to start writing code. Try creating a PHP file and write some echoes or whatever in it. Save it and then click the play button on the top toolbar to open a new browser window/tab directed at your site. Run sudo pico /etc/php5/apache2/php.ini to open and edit the PHP configuration file. Find the date.timezone parameter and set it to your liking. You can find the list of valid timezones here. Find the short_open_tag parameter and set it to Off. This is to prevent you from coding with short open tags, which might not be supported on some servers. Press Ctrl-X and then Y to save and close the file. Run sudo pico /etc/apache2/sites-available/default to open and edit the apache2 virtual host configuration file. In the <Directory> tag for root (/) and /var/www/, set AllowOverride to FileInfo Indexes. Save and close the file. Run sudo a2enmod rewrite proxy proxy_http proxy_ftp proxy_connect to enable the listed modules needed to support mod_rewrite. Run service apache2 restart to restart the apache2 server. That’s it. Now we’re practically ready to start cracking. I might write some more about the actual code I’m working on, which is based on CodeIgniter 2 integrated with Doctrine ORM version 2, but I can’t make any promises as of now. This is a post long overdue. Originally started as a favor to a good friend of mine, this now has also turned into my personal quest to document my efforts to set up my PHP Development Environment on my MacBook. DISCLAIMER: This is some geeky stuff, you have been warned. I have an Apple MacBook A1342, so the documentation pertains to that specific hardware. If you have another type or brand of computer, or if you choose another operating system, the following instructions should not apply to you. You should go ahead and install your operating system as you would normally. Fire up your MacBook and let it enter Mac OS X as usual. Find Bootcamp Assistant in your Applications folder and open it. Set up your BOOTCAMP partition. As I’ve done this 2 years ago, I don’t need to do it again, and I can’t remember the exact steps, so please go visit Apple’s support site if you need more detailed information. Insert your Windows 7 64-bit installation DVD and restart your MacBook. Hold down the Option key while booting up to show the boot options, and select the DVD. Install Windows 7 as you would normally. Select BOOTCAMP as the partition to install Windows 7 on. At this point you should be able to log into Windows 7. Now, insert your Mac OS X installation DVD, find Bootcamp for Windows, and install it. Install any additional drivers and software as required. Voila! Your base operating system is now ready. I choose to use a virtual machine to host my PHP and MySQL server. Why? I can emulate the deployment server environment as closely as possible without having to compromise my development environment. This way I can only install server software as necessary, perform server configuration as if I was doing it on the real server, and reinstall the entire server if necessary without having to install my base operating system. I can take the VM with me and run it on another computer if need be. Installation DVD (or disk image file) of a guest operating system of your choice, or preferably an image of it. I tend to like the latest server version, so I use Ubuntu 11.10 Oneiric Ocelot Server Edition (64-bit), which is downloadable from the Ubuntu website. A preferably fast and reliable internet connection. Install Oracle VirtualBox. Just click next next next done. Simple as that. Fire up Oracle VirtualBox and click File –> Preferences. Set your Default Machine Folder, or leave it as it is if you prefer to do so. Click OK. Specify a name for your new virtual machine, set Operating System to Linux and Version to Ubuntu (64 bit). Click Next. Set the RAM allocated for the virtual machine. Usually 512MB is enough for servers, but you’d probably want to use more if you intend to install the desktop version of Ubuntu. Click Next. Create a new virtual hard drive. Leave all options as it is and click Next to bring up the virtual hard drive dialog. Select VDI, Dynamically Allocated, and set the size to your liking. I use 20GB. Click Next, then click Create. After the hard drive dialog disappears, click Create again. Insert your Ubuntu installation DVD or set the disk image file in Settings –> Storage –> IDE Controller and start your virtual machine. Select English and then select Install Ubuntu Server. Select your language and location, and configure the keyboard if necessary. I use English (U.S.). Set up your partitions. 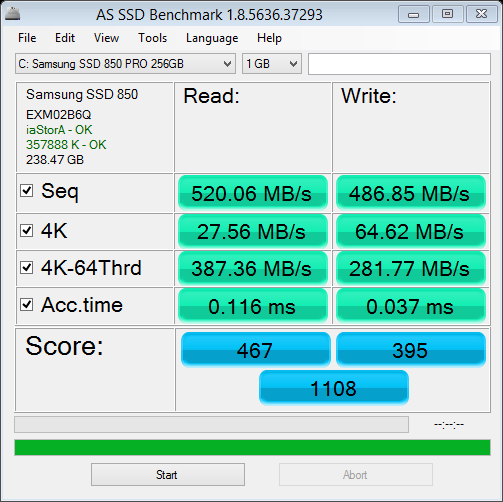 To keep it simple, I use guided partitioning using the entire disk. Set up your user name, password, and home folder encryption (if you want to). When asked for a proxy configuration, leave it blank. The installer should start downloading stuff using apt. Choose your automatic security update setting. In the software selection, select LAMP Server and Mail Server. 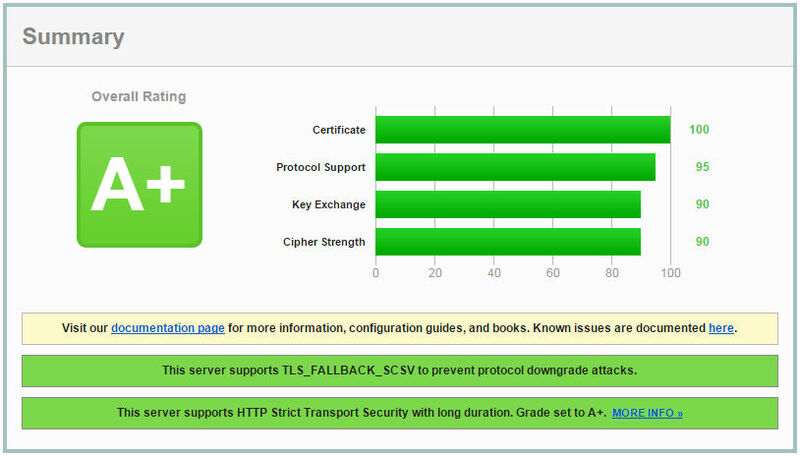 Select Internet Site for the mail server setting. It’s safe to install GRUB as recommended, go ahead and do it. Run sudo apt-get update to update the repository to the latest source. Run sudo apt-get dist-upgrade to upgrade all installed packages to the latest version. Run sudo apt-get install dkms to install Dynamic Kernel Module Support (DKMS), which will be used to install VirtualBox guest additions on your Linux machine. Run sudo mount /dev/cdrom /media/cdrom to mount the VBoxGuestAdditions media. Run cd /media/cdrom to switch directory to the mounted media. Run sudo sh ./VBoxLinuxAdditions.run to install the VirtualBox Guest Additions. Shutdown the virtual box, go to Settings –> Shared Folders, and create a shared folder referencing a directory of your choice on the host machine. Take note of the share name. Run mkdir /home/[your_username]/public_html to create your own public html directory. This will be the mount point of the shared folder. Run id [your_username] to find out your uid and gid. Take note of this. Run cd /etc/init.d to change to the startup script directory. Run sudo pico vboxshare-automount to open pico and create a new file called vboxshare-automount. Write mount -t vboxsf -o uid=[your_uid],gid=[your_gid] [your_shared_folder_name] /home/[your_user_name]/public_html in the file. Press Ctrl-X and then Y, enter, to save the file. Run sudo chmod +x vboxshare-automount to make the file executable. Run sudo update-rc.d vboxshare-automount defaults to make the script run on every startup. Restart your virtual box, then login and run cd public_html. If you run ls, you should see the contents of your shared folder there. Shutdown your virtual box if it’s not already off. Go to Settings –> Network –> Adapter 1. It should be set to NAT by default. Click on Advanced and then Port Forwarding. Click on the add icon, then set rule name to http, protocol is TCP, host port 8080, and guest port 80. Start up your virtual box. Fire up your browser and go to http://localhost:8080. You should see the default apache2 page saying that it works. Now go to the virtual box’s console and run sudo a2enmod userdir to enable per-user directory service. Run sudo pico /etc/apache2/mods-available/php5.conf to edit the PHP5 module configuration. Comment out the part between the <IfModule> tags to enable PHP parsing in home directories. Run sudo /etc/init.d/apache2 restart to restart the apache server. On your host machine, create a new file info.php in the root of the shared folder. Fill it with the usual phpinfo(); code. Direct your browser to localhost:8080/~[your_user_name]/info.php. You should see the PHP information page there. That’s it. Now we have a working Apache/PHP server running on Ubuntu and accessible seamlessly through our Windows machine. Next we should check if we have phpMyAdmin and everything else we need to really start cracking. But I think I’ll save that for another post: Part 2. Sadly, nobody had it. Word is that the supply was halted from I don’t know where. Bottom line is that there is no telling when a resupply would take place. This baby fails in one requirement I made for myself: it is not ambidextrous. I thought I was gonna have some problems flying with my right hand, because (1) I’m left-handed and (2) I couldn’t access the mouse while I played. As it turns out, my right hand works just fine. I guess the same thing happened when I first learned to use the mouse with my right hand, to save everybody the trouble of providing a left-handed mouse. And the mouse, it turns out I didn’t need it so bad, and whenever I needed it I could always revert to using the trackpad with my left hand, which was free anyway. So there you have it, my new joystick. I’ve flown a couple of times using it on 737s, 747s, Cessnas, various vintage planes, and even an F-14. I’ve also managed to land a 737 manually in a crosswind, not to mention F-14 night landings (which were particularly hard because of the high approach speed). I’m overall satisfied, and although I do hope that someday I’ll have my own virtual cockpit, this little guy is more than enough for now.